The Dell XPS 13 for 2017, which follows a minor refresh in late 2017, is a much bigger deal in the update stakes. It's slimmer and lighter than ever before, getting closer to the skinny factor of its slimmest rivals. And, like the last XPS 13 models, it's a fantastic machine in just about every respect... as long as you don't need a touchscreen or a flippy hinge. We've been Dell XPS 13 fans for ages. But these machines have always been a bit thicker than most of their obvious rivals. That's what Dell has changed this time around: the 2018 model is just 11.6mm thick, which is a massive 50 per cent slimmer than its predecessor's thickest point. It's not as thin as the 9mm-thick Acer Swift 7, but thanks to the XPS 13's ultra-slim screen bezel, the entire laptop's footprint is not that much bigger than the display itself. This is portability heaven, therefore, particularly as it only weighs 1.2kg. Slimfast waist-trimming aside, the classic Dell XPS 13 styling hasn't changed. There's rigid aluminium on the top and bottom, with a soft-touch carbon fibre finish inside. As usual, every part of this little computer is stiff and unmoving, much like an Apple MacBook. Build quality like this is a big part of why XPS 13s are so popular. There's no showy, fancy features though: the hinge only folds back to a normal extent, around 130 degrees; you don't get a stylus; and there's no touchscreen. Dell does make a 2-in-1 hybrid XPS 13, but this version is for people who think hybrids are a bit, well, flimflam. Despite no folding hinge in this review XPS 13, there is one very neat bit of smart hardware design: the power button to the top-right of the keyboard plate also doubles as a fingerprint scanner. It's pretty much the smartest-looking integration of this hardware we've seen in a laptop - save for the Huawei MateBook X Pro - and it works well, too. The Dell XPS 13 also has infrared (IR) cameras that sit under the display, allowing you to login using your face. This functions well, although some people hate the camera layout of the XPS 13, as it's positioned towards the base of the screen. The lower angle makes for less flattering video calls, highlighting those jowls and double chins. 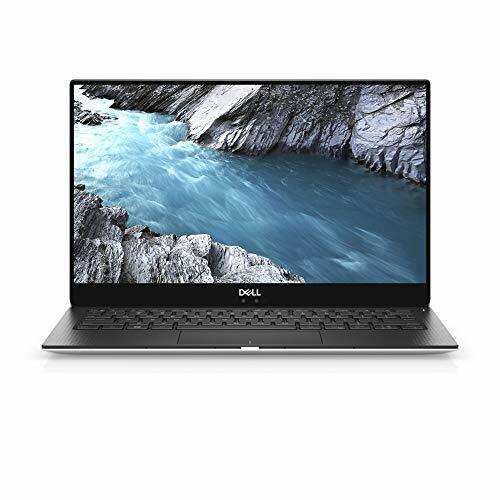 One other possible point of contention in the new Dell XPS 13 is its connection arsenal. There are no traditional sockets here. That means full-size USB, no full-size SD card slot, and no HDMI port. If you're desperate for these, check out the just-slightly-older XPS 13 9360 while it's still around (it also has a "big" USB and an SD slot). In place of these the new XPS 13 has three USB-C ports, two of which support the ultra-fast Thunderbolt 3 standard. They may be small, but they're eight times faster than a normal USB 3.0 port. Technology, eh? One of these USB ports will be taken up by the power adapter during charging. There's also a microSD slot, and a little LED display that shows you the rough battery level when you press a button beside it. Handy. The new XPS 13's keyboard is a little shallower than the old version, but it still delivers a very satisfying typing experience. There's a good amount of resistance to the keys. And like every aspect of this laptop, the keyboard feels high quality. There's an LED array under the keys to let you see what you're doing when it's dark, too. The Dell XPS 13's trackpad is great as well. It has a solid clicker, it's about as big as it could be considering the laptop's frame, and the surface is ultra-smooth textured glass. It feels great. This is the second wave of Dell XPS laptops to use one of Intel's 8th generation processors. Head over to the Dell website and you'll find Core i5 and Core i7 options. Thin laptops like this used to have two cores, but Intel's 8th generation ones have four. That means almost double the power on tap, compared to the Dell XPS 13 you might have bought in mid 2017. It can handle just about anything. Its 8GB RAM and a fast 256GB SSD also make Windows 10 fly, too. The Dell XPS 13 still isn't much good for gaming, though. GPU power hasn't changed much in this generation of Intel processor, and games don't really run significantly faster this time around. You can play old games like Skyrim if you lower the graphics settings quite a bit. But this is not a gaming machine. Not at all. There's no option to add discrete graphics either - something that the Huawei MateBook X Pro offers - not that we can imagine Dell being able to fit such a chipset into this XPS anyway. This thinner XPS 13 also has a slightly smaller battery capacity than its predecessor. Capacity has been downgraded from 60Wh to 52Wh, so it's still a large capacity, just not a gigantic one. In our testing the Dell XPS 13 lasted for between 10 and 11 hours of light use, at the sort of brightness you might use indoors. You lose an hour or so of use compared with the old fatter XPS 13. But you'll still get a full day's work out of a charge, which is the important thing. You do trade a little battery life and larger connectors to slim down to 11mm thickness. But if you value a slim frame, it's not too much of a sacrifice. If you're after a high-quality laptop with a touchscreen and 360-degree hinge, look for the Yoga 920. It's a little thicker and heavier than the Dell, but lasts even longer between charges, and comes with a neat stylus for scribblers and designers. It's a little more expensive, though. The Surface Book 2 is the kind of laptop many people would like, but that few can afford. Its screen pops off to become a tablet, all models have a super-sharp 3240 x 2160 screen, and the magnesium casing is great. However, it's significantly heavier than the XPS 13 and a starting price of £1499 will make a few eyes water. One of the best Windows laptops going, the MateBook X Pro has the slimmest bezel in the business, oodles of power, and even discrete graphics on board. It can't last as long as even the new Dell, though, with around eight to nine hours of video-watching battery life being its only real shortcoming.